Italian Wedding Soup is a classic chicken soup. It’s one of those comfort foods from my childhood. 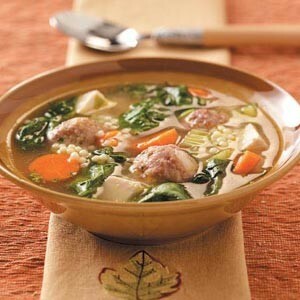 I love Italian Wedding Soup served with a hard roll or a crusty piece of Italian bread. As with all recipes, you can alter it to fit your taste. Any type of pasta works with this soup. I have seen it served with ditilini pasta or shells. Spinach or escarole can be substituted for the kale. If you like chunky vegetables, don’t dice them, chunk them. Use your imagination….but consider making Italian Wedding soup. Your family will thank you! For the meatballs, put chicken, pork, bread crumbs, parsley, Parmesan, garlic, oregano, basil, salt, pepper, and egg into a large bowl and use your hands to mix well. Use a teaspoon to measure out meat for even sized meatballs. With damp hands, shape them into 1-inch balls and transfer them to a large plate. Cover and refrigerate until ready to cook. For the soup, melt butter in a large soup pot over medium heat. Add onions, carrots, celery, garlic, salt and pepper and cook until translucent and fragrant, about 4 minutes. Stir in broth, tomatoes, and 2 cups water. Cover and cook 10 minutes over medium heat or until soup comes to a boil. Add meatballs and acini de pepe to the boiling soup and stir to make sure they are fully submerged. Cover and simmer for another 15 minutes over medium heat. Stir in kale. Test a meatball and a piece of acini de pepe to ensure that they are fully cooked. Taste and adjust seasoning. Serve immediately.